Drombeg Pride has a hospital appointment. 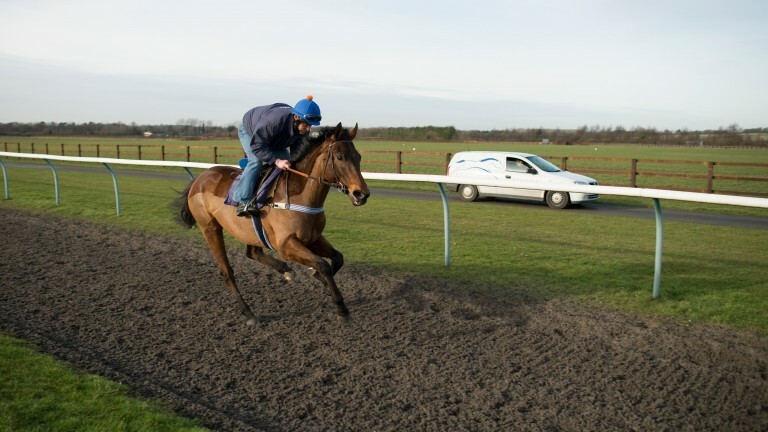 The ten-year-old gelding, who failed to win in 26 outings on the Flat and over jumps and is now on the equine teaching staff at the British Racing School in Newmarket, has been diagnosed with a heart condition that requires him to have regular, although not frequent, check-ups. So he duly presents himself at the Diagnostic Centre at Rossdales Equine Hospital at Exning, just outside Newmarket. He doesn't know it, but Drombeg Pride is a fortunate horse, for at the hospital he is in the hands of Professor Celia Marr, whose iridescent CV includes studying at the universities of Glasgow and Pennsylvania before becoming a lecturer in the veterinary school at Cambridge, followed by spells at the Valley Equine Hospital in Lambourn and the Royal Veterinary College. Her qualifications form an alphabet soup of letters – BVMS, MVM, PhD, DEIM, DipECEIM and MRCVS. And away from her Rossdales duties, she is editor of the Equine Veterinary Journal, and a driving force in the Veterinary Advisory Committee which is crucial to the process whereby the Levy Board distributes its funding to equine research. Marr is at the top of her tree, and to the fore of late on account of her role in the diagnosis and treatment of Sprinter Sacre, whose progress after his Kempton heart scare she is continuing to monitor. But Nicky Henderson's charge is not the only jumping legend to have come under her care. In autumn 2008 she treated Denman after that great chaser had been found to have an irregular heartbeat. Indeed, she treated him so effectively that he went on to win a second Hennessy Gold Cup the following year. And when in April 2012 the highly promising Henderson-trained hurdler Spirit Son inexplicably collapsed in his box, she was extricated from a Newmarket party and, pausing only to load up the necessary hardware, headed straight for Lambourn, as Henderson memorably described in the Racing Post: "Celia's arrival at about 9pm was a bit like M*A*S*H descending on us, as she and her intern swept in armed with equipment and carried out a multitude of tests and set up drips and fluids." Spirit Son survived a life-threatening neck injury, although his racing career was over. Today's first patient is at the other end of the scale of eminence from Sprinter Sacre, but he still receives five-star treatment. Having listened to Drombeg Pride's heartbeat through the old technology of the trusty stethoscope, Marr wheels out the latest heart-scan equipment, a trolley-load of technical wizardry. 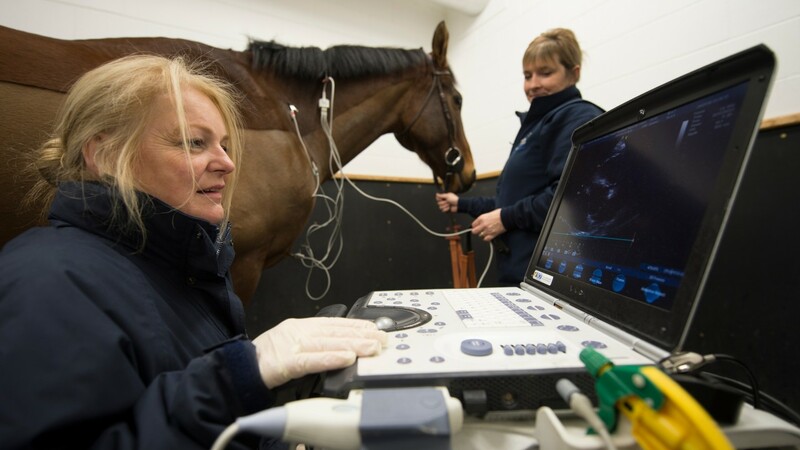 Centrepiece of the trolley is an elaborate laptop on which is displayed, as she moves the sensor over the horse's cardiac area, images which to the layman look much like those so familiar in antenatal clinics. Drombeg Pride's ticker is not completely pristine, and the swirl of images on the laptop feature regular little blobs of bright green, which indicate he has a minor leak from his mitral valve. That leak in itself is no cause for alarm, but the big test will be to see how his heart performs under pressure, which means a bout of radio-telemetric ECG in the form of a bracing canter at the British Racing School. In preparation for this next phase of his examination, Drombeg has four sensors and a small Bluetooth radio transmitter, about the size of a cigarette packet, attached securely under his girth. He is then boxed over to the BRS, and as we follow in a hospital van Professor Marr offers a brief seminar on the equine heart and her two most famous patients. "Put simply, atrial fibrillation is a condition that causes an irregular heart rate, and steeplechasers are prone to the condition, since they tend to have a large heart in relation to their body mass," she says. "The bigger the heart, the greater the advantage, but heart size is by no means the sole determining factor of performance – although it is an important one - and with that advantage comes risk. "The key difference between the cases of Sprinter Sacre and Denman is that Sprinter self-corrected and Denman required treatment, and the example of Denman shows that heart problems in horses are not related to exertion. "In his case, the problem had begun during his summer holiday out at grass, and as soon as he was back cantering in the build-up to the new season, they knew immediately he had a problem. We treated him with drugs to suppress random electrical activity in the heart. "With Sprinter Sacre it's a case of monitoring him as his exercise rate is increased, to check there are no warning signs." At the BRS, Drombeg Pride, ridden by Robert Moore, warms up with a few minutes' trotting, then he settles into a brisk canter while Marr, squeezed with her monitor into the passenger seat of the van keeping alongside the horse, studies his heart function on the screen. The heartbeat is regular. All is fine. Drombeg can return to his box. Back at the equine hospital, we pause at the sorry sight of a chestnut mare who for some unknown reason had panicked in her paddock and run straight through a wooden fence. Now she stands abjectly, attached to various drips, and with her scars and cuts looking like she has just gone 15 rounds with Mike Tyson. Unhurried treatment will in time see her restored to health. Next port of call is the intensive care unit, where a four-day-old foal needs Marr's attention. This little colt has Neonatal Maladjustment Syndrome, a condition first described by Peter Rossdale, who started the practice which bears his name in the 1950s. "The foal is not actually premature," Marr explains. "There is a lot of development which has to go on during the last week before birth so that the foal is ready to face the outside world and in this case he has not quite adjusted. "He has a slightly depressed brain function, his gut isn't working properly, and his lungs are not very strong. He has a whole package of abnormalities, and the treatment of NMS is really about providing all the things that the placenta was delivering while he was inside his mother. "We treat foals with NMS by giving them oxygen and fluids, plus drugs that will help support their blood pressure, and feed them glucose and other nutrients by drip. "It's really a case of waiting for the foal to make those final steps of adjustment and this fellow will leave the hospital in a few days and be perfectly healthy." That young horse is a thoroughbred, but Rossdales does not deal only with racehorses. Among other patients is an aged pony from far up in Norfolk where the pasture can be abnormally sandy, and where over time the sand accumulated from grazing has brought on the dreaded colic. This pony accumulated so much sand that it had to be removed by major abdominal surgery in 2011 – since when each day he has eaten psyllium, a foodstuff that helps to remove sandy substances. Recent x-rays have given no cause for concern, and a recent minor bout of colic is under control. Meanwhile word arrives of Marr's most distinguished patient. Sprinter Sacre's heart function is being monitored daily as he undertakes light exercise, and today's ECG readings, emailed across from Seven Barrows, have just come through. She studies them closely before pronouncing that all is well. We load the van again, and head to Ed Dunlop's Newmarket yard. Four of the Dunlop horses need scoping. This is a familiar procedure for checking the condition of the respiratory system, but these four have lost their appetites and are suspected of having stomach ulcers. Under mild sedation, each horse has a flexible tube – an "introducer" – run up one of his nostrils and into his oesophagus, and then, the end of the tube dangling out of his nose, is led to the box reserved for treatment. Through the introducer is gently fed a tiny camera fixed to the end of a three-metrelong cable, and once the camera has been eased as far as the stomach Marr navigates her way round, as water is pumped along the tube to clear away any residual mess and improve her view – the tumbling tunnels of organs on the screen looking like something out of a Jules Verne fantasy. The first horse has a few very minor ulcers but the other three are clear. Job done. Back at the equine hospital, a sports horse has been brought in lame. A bone scan shows increased activity over the ribs, and after close examination the verdict is that the horse has cracked but not fractured a rib. All in a day's work for Celia Marr – and over at the British Racing School, Drombeg Pride is settling down for the evening, content in the knowledge he won't need another hospital appointment for at least two years.